“An Oxford woman who is 100 today never got a degree, but she became the friend and colleague of some of the most eminent scientists of the early twentieth century”. The woman referred to was physiologist and clinical pathologist Mabel Purefoy Fitzgerald (1872-1973), who belated became an Oxford graduate at 100 years old in 1972. In recent years there has been a significant effort to recover the stories of women in science and medicine, both those who were never recognised in their time and those who were, but have been largely forgotten. Ada Lovelace Day for instance includes Wikipedia editathons among its events, which you can read about here, and Dundee University is today launching its Women in Science Festival, which includes an historical element. In this post I'd like to highlight the work of Mabel Fitzgerald, a female scientist who remains a shadowy presence in the historical record, and in particular, the period of her life spent in Edinburgh. Fitzgerald firmly believed women were just as capable of men’s work, and armed with what must have been stubborn determination, she refused to allow educational barriers block her from following a scientific career. What better time to celebrate her than International Women's Day! After working on the Fitzgerald family archive in Oxford a couple of years ago, I became intrigued by this woman who not only studied science and medicine unofficially and in collusion with some of the most distinguished Oxford scientists, but also impressed the neurophysiologist Francis Gotch so much that he later had the regulations concerning female students altered. Gender prohibited Mabel from studying for a qualification in Oxford when she moved there in the 1890s. Yet, by the early 1900s she had launched a career in laboratory medical science and would produce ground-breaking research on the role of oxygen in breathing, including an output of Royal Society publications in her name only. Indeed, a list of her achievements in this male dominated profession is quite remarkable (summarised at the end of this blog). Despite her achievements, little has been written about Fitzgerald. In 1999 Robert Torrence noted, ‘physiologists remember Mabel Fitzgerald principally for one important paper in which she described the observations she made in Colorado” and “she personally was forgotten, even in Oxford”. Last year, I was delighted to see Martin Goodman’s article published by the Royal Society concerning Mabel’s high altitude research during the 1911 Pike’s Peak expedition in Colorado, where she accompanied an all-male team led by the well-known physiologist John Scott Haldane. You can read this here. 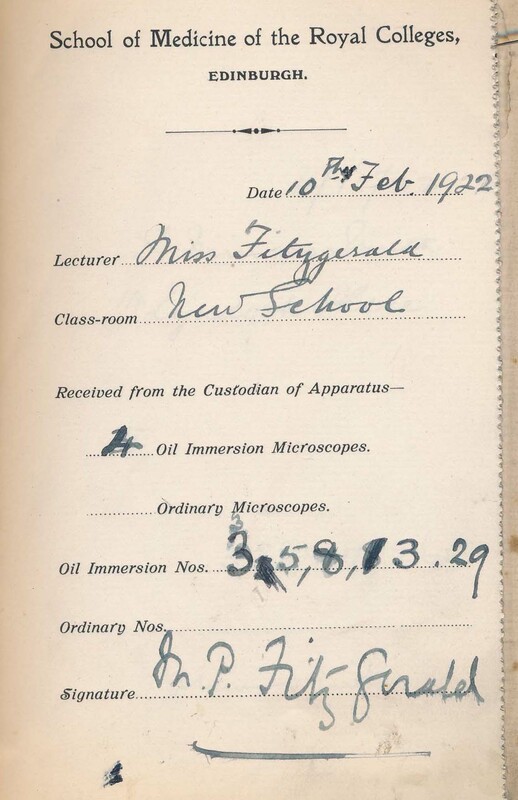 "The Dean intimated that he had received from the Clerk to the Royal College of Surgeons a notification of the examination and recognition of Miss Mabel Purefoy Fitzgerald as Lecturer in Practical Bacteriology. It was decided unanimously to recognise Miss Fitzgerald". 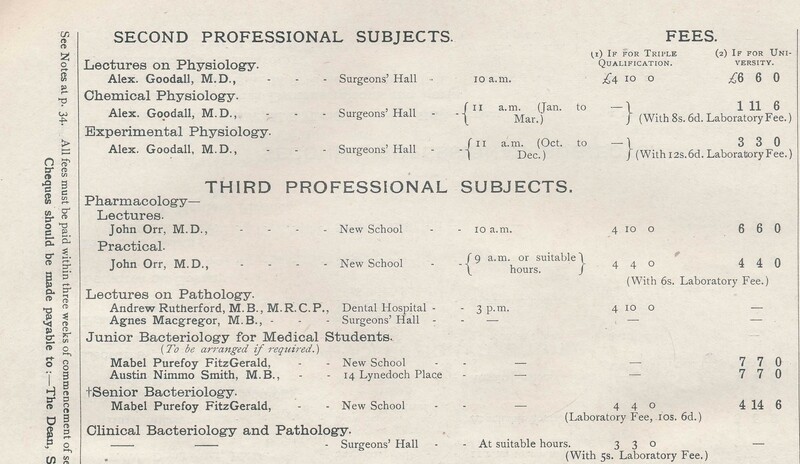 The School of Medicine provided extramural classes in medicine and surgery, which prepared students for the licentiate examinations of the Royal Colleges. 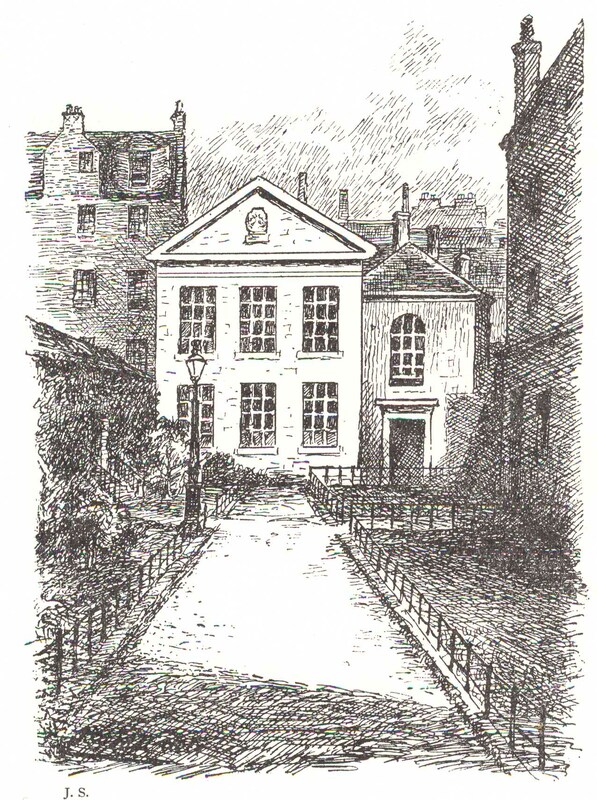 The School's administrative base was at Surgeons’ Hall, and lectures were held here and other nearby locations, including New School on Bristo Street, where Mabel held classes for both men and women. While women had been members of the medical profession for several decades by the time Mabel took up her posts in Edinburgh, they were still isolated for the most part from the mainstream. Moreover, few teaching posts were open to women at the turn of the century; Jex-Blake’s Medical School for Women closed in 1898 and the Elsie Inglis’ Edinburgh Medical College for Women merged with the Extramural School of Medicine at Surgeons’ Hall. In the School’s Calendar for Session 1916, only 1 woman out of 53 “present lecturers” were recorded that year, that being Inglis. 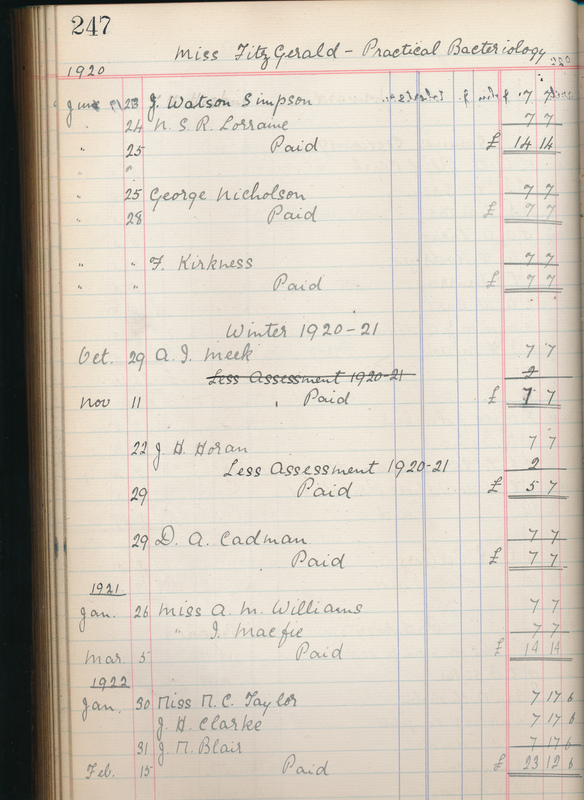 By the 1928 session, 2 women out of 43 “present lecturers” are recorded. One of those women was Mabel Fitzgerald, and the other Agnes Macgregor, Lecturer in Pathology at Surgeons’ Hall. While the School therefore did provide a platform for women to teach, there existed a distinct hostility to medical women well into the twentieth century, and it would be wrong to suggest that the presence of a few female lecturers signifies any kind of meaningful acceptance of women as teachers of science and medicine. Nevertheless, what seems especially remarkable about Mabel Fitzgerald's role is that she sat on the Board of Management for the duration of her time at the School; a seemingly respected member who regularly attended meetings throughout the 1920s. Indeed, she appears to be the only female lecturer to have done so during this period when women were still relegated to the margins of science and medicine. 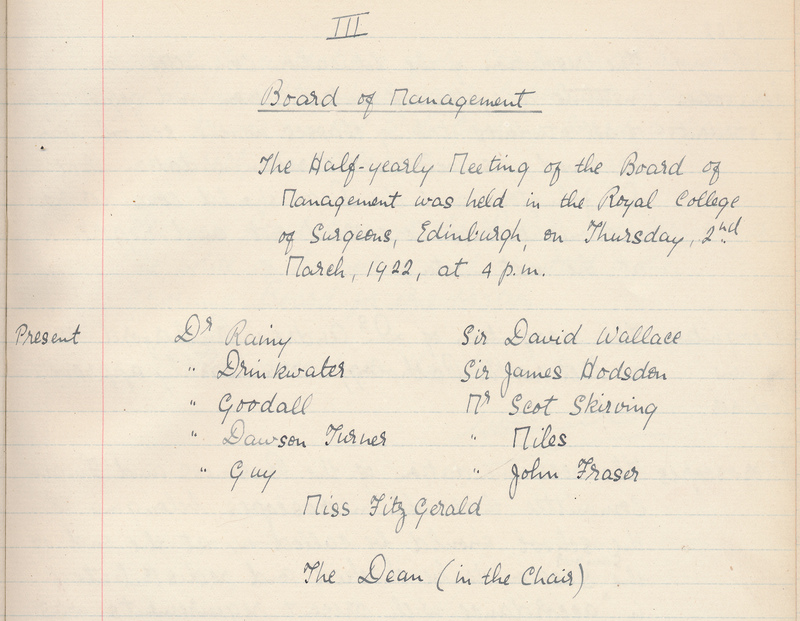 Fitzgerald seems to have stopped attending Board of Management meetings in the 1930s (and also the world of science) when she returned to Oxford. However, correspondence in the collection reveals she kept in frequent contact with the School until much later in her life, and she clearly felt a strong connection with Edinburgh in light of the opportunities she had found here. Did Mabel feel daunted in the male-dominated teaching world at the School of Medicine at Surgeons' Hall? It seems unlikely. She does not appear to have been a shrinking violet by any means, and was assertive in her role on the Board of Management, often requesting funds for apparatus and teaching assistants. It may be that her earlier experiences prepared her for such an environment; she was both colleague and friend to some of the most notable scientists of her time, including Thomas Graham Brown (and his father, President of the Edinburgh College of Physicians), the Haldanes (father and son), George Dreyer, Gustav Mann, Archibald Macallum, Charles Sherrington and William Osler. She worked in numerous labs alongside men throughout her career, in Oxford, America and Edinburgh. It also seems likely that the time she spent travelling as the only female with Haldane and his expedition team in 1911 equipped her to adapt to environments which would have frankly intimidated or terrified many women of her time. She was comfortable around men and was unquestionably hardy; she spent much of the the Pikes Peak expedition travelling alone (accompanied by a mule) across difficult terrain in Colorado visiting different mining camps to take detailed respiratory measurements of local populations at a number of altitudes. As a woman she was not permitted to climb to the same heights as men (literally and figuratively), however her letters do indicate that she enjoyed the men’s company when she was with them at the start of the expedition, and also when she visited them at the top of the summit. What is certain about Mabel though, as Goodman notes, the Pikes Peak Expedition "shows the extremes to which Fitzgerald had broken the mould that expected science by women to be conducted on the domestic front". Martin Goodman, 'The high-altitude research of Mabel Purefoy Fitzgerald, 1911-1913', Notes and Records of the Royal Society, Vol. 61, Nov 2014. Elaine Thomson, 'Women in Medicine in late Nineteenth and Early Twentieth-Century Edinburgh: A Case Study, PhD Thesis, University of Edinburgh, 1998. R. W. Torrence, 'Mabel's Normalcy: Mabel Purefoy Fitzgerald and the study of man at altitude', Journal of Medical Biography Vol 7, 1999.